This is often a very difficult question to answer accurately. The most obvious way to measure this would be to put a flow meter in line with the dispense tube. But this may be difficult or expensive to achieve in many different types of applications. There are a variety of flow meter types available. Magnetic flow sensors are useful where caustic chemicals are being measured. But the liquid must have significant conductivity. So it will not work at all with petroleum based products, among others. They are also quite expensive. Very simple flow sensors employ a paddlewheel which is inserted into the liquid flow. While this is straight forward, the material of the paddlewheel must be compatible with the liquid. The accuracy is only fair, and may be compromised if the liquid is pulsing, as often happens in a pumping operation. Turbine sensors are very similar, but are typically slightly more accurate and quite a bit more expensive. A variety of other types of sensors have also been employed for industrial use. They include Hall Effect sensing, ruby bearing impellor sensors, and magnetic bearing sensors. Each type requires a tradeoff between accuracy, cost, and liquid compatibility. The ideal method for determining flow rate is to measure the change of weight during a period of time. The container for the liquid is placed on the platform of an industrial scale. The weight is noted at the beginning of the process. Subsequent weight measurements are taken at regular intervals. The change in weight is divided by the amount of time to calculate the rate of flow. This solution is elegant, simple and quite inexpensive. The electronic scale is never in contact with the liquid. Therefore the scale platform does not have to be fabricated from any special type of material. There are no moving parts. Accuracy is only limited by the overall accuracy of the digital scale, and the time allowed to determine the flow rate. 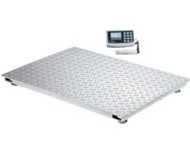 Standard platform scales may be suitable for moderate accuracy levels. Bench scales may be a better choice when dispensing from smaller pails or buckets. If the liquid is contained in a larger tank or tote, large floor scales may be used. In all cases, the digital indicator includes a clock circuit to accurately measure the amount of time. For better accuracy results, ultra precision scales provide an excellent solution. The Surface Acoustic Wave (SAW) scales developed by Arlyn Scales, offer accuracy levels that are twenty times better than those provided by standard strain gage load cell industrial scales. For example, a 200 lb capacity SAW scale has a useful readability of 0.02 lb. A regular scale will typically have a useful readability of 0.5 lb. This additional accuracy may be used to simply provide a more accurate flow rate. Or, it allows the user to determine the flow rate much more quickly. Of course, any combination of accuracy and speed may be selected. These ultra precision industrial scales have the added advantage of being much more rugged then the typical digital scale. This is very important, as this type of scale can receive significant shock loads when tanks are being placed onto the scale platform. The flow rate that is determined by the electronic scale should be displayed on the digital indicator. It should also be available for transmission and recording by associated equipment. Different data formats may be used, such as serial data transmission by RS-232 or RS-485 protocols. Universal Serial Bus (USB) is another format that has become popular, and allows the data to be directly input into data base files and spreadsheet files. If there is no computer at the scale location, a USB flash memory stick can also collect this data. The memory sticks may then be taken to any computer for later processing. Another alternate format would be to send the data through an Ethernet port on the industrial scale. Typically, many industrial manufacturing facilities have pre-installed local area networks for their computers. The scales may then be simply connected into this network. Flow rate data could then be forwarded to any computer on that network for collection and analysis. The flow rate could also be monitored from within that system.